Today's featured authors are Nancy Brauer and Vanessa Brooks of the webserial Strange Little Band. They've been publishing SLB since May of 2009, and the story is really hitting its stride as we enter 2010. Updates are published twice a week, with a bonus story every other week or so. This is the fourth interview in the Profiles in Web Fiction series. The other interviews in the series can be found here. The authors describe Strange Little Band as dark, paranormal romance. It follows the lives of Shane and Addison, co-workers whose lives are forever intertwined by their employer, the unscrupulous Triptych Corp. To make things more complicated, both Shane and Addison have paranormal abilities, which turns even their most trivial interactions into epic mind games. Toss in a healthy dose of hormones and you've got the recipe for an intriguing story. Nancy was kind enough to answer my questions via email. 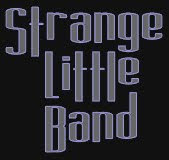 Strange Little Band debuted on May 1, 2009 at http://www.strangelittleband.com. Vanessa and I have quite a bit of web design experience, so setting up a self-hosted WordPress site was easy. We'd written together previously, but this is the first time we've published a web serial for public consumption. I was the one who pushed to publish SLB online. The more I read about the time and effort required to get literary agents' and publishers' attention, the less inclined I was to play the game. The fact that Vanessa and I had already written 140,000 words of the first draft helped, too. Most of the work has been editing, filling in gaps in the storyline, and lots and lots of promotion. The number one benefit of publishing online is reader feedback. Interacting with the audience is fun. They tell you when you're doing something right, and when you're not being clear. Vanessa and I primarily communicate with readers through SLB site comments, Twitter, and the SLB forums. The number one benefit of publishing online is reader feedback. Interacting with the audience is fun. They tell you when you're doing something right, and when you're not being clear. The flexibility of online publishing is another huge plus. If you find a typo, you click "edit," make the change, hit "publish," and you're done. You're free to change your posting schedule. Want to change the look of the site? Go for it. You can experiment with integrating reader suggestions, creating character Twitter accounts, and more. The only thing holding you back is your time, desire, and web skills. The big drawback is having to do everything yourself. Unless you've got a substantial budget or an army of fans willing to work for free, the author is responsible for all of the stuff a print publisher usually handles: developmental editing, copyediting, cover art, marketing, advertising, data backups, etc. All of this take a lot of time. The effort is considerable, especially if you have a day job. Revenue comes from three sources: donations through the SLB site, bids from Project Wonderful advertisers, and sales from the SLB Zazzle store. It's a grand, ongoing experiment which is alternately fun and frustrating. We're learning as we go. That's a tough question. I think there will be a lot more, much like the explosion of web comics. Serials will probably split into two categories: "professionals" and just-for-fun types. By "professionals" I mean those whose authors rely on serials as a significant portion of their income. It's easy to put a donation button on a website. Convincing readers to donate or buy merchandise takes a lot more creativity and effort. It's hard to say where web serials, video webseries, and other online entertainment will be in five years. So much is in flux right now. Print publishers are struggling, eBook readers are trying to go mainstream, and piracy is rampant. It remains to be seen if consumers will find enough value in digital media to spend money on it. In general people value tangible goods. For some, if you can't hold it in your hands it's okay to grab a copy. I don't mean to stir up a digital rights management (DRM) debate. It's just that writing and publishing anything online takes time. Unless the writer is extremely frugal or independently wealthy, he or she will likely need revenue to justify the time and effort of publishing. Your web serial is different from others in that it's a collaborative effort. I'm interested in how exactly you and Vanessa collaborate. How do you divvy up the workload? We wrote the first draft of SLB via email a few years ago. It was a giant email volley with Vanessa writing primarily from Addison's point of view and me from Shane's. We shared the other characters as necessary. The whole thing was made up on the fly! Editing is crucial to keep the voice consistent and not give the readers whiplash from POV changes. Although we're in editing and revision mode, we still rely heavily on email. I do the editing for the main SLB story posts. Vanessa's writing the bonus stories. We both fill in gaps in the storyline. Who writes the new bits depends on the POV for the new section and my and Vanessa's schedules. Typically we email each other drafts in the body of an email message. We plot and plan by email, IM, and sometimes Twitter direct messages. We've only spoken once by phone! First and foremost, be patient. Unless you can throw a lot of money at an advertising blitz, it'll take time for readers to find you. Make it easy for them. Think about who might like your story. Connect with them, be it on Twitter, forums for similar web serials, or other ways. To get started, check out successful web authors like MeiLin Miranda, MCM, and Alexandra Erin. Novelr and WebLit are warehouses of good ideas, too. It's also important to plan your story ahead and have a posting buffer. By the latter I mean have two or three posts ready to go at any given time. Unfortunately, I don't always follow my own advice on this front, so the day before posting can be stressful. At least I usually have the first draft done, so it's only last-minute editing. Be sure to check out Strange Little Band's website. I wish I had Nancy's tenacity when it comes to promotion - a lot of us could learn a trick or two from her! Thanks Qazy, and thank you Peter for the interview. It was fun!